Our first game against Fulham was on February 6th, 1904 when Fulham, then in the First Division of the Southern League, passed through all seven Preliminary Qualifying Rounds to make their debut in the First Round of the FA Cup. 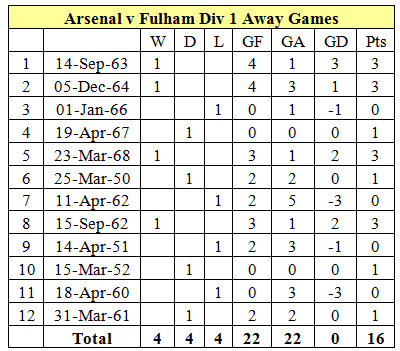 The eighth game was one too many as Woolwich Arsenal won 1-0. This was the one and only time the two clubs have met in any Cup competition. Fulham gained professional status on 12 December 1898, the same year that they were admitted into the Southern League’s Second Division. They were the second club from London to turn professional, following Arsenal in 1891- then named Royal Arsenal. 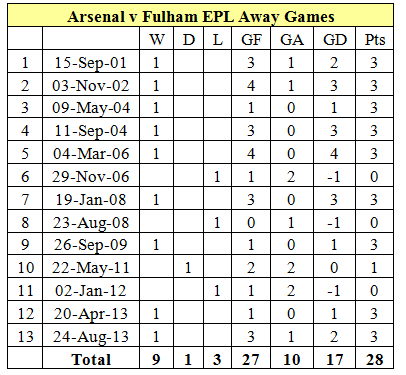 While Fulham have never beaten Arsenal in away games (they have lost 22 tied 5 and been outscored 67 to 23), their home record is a tad better having won 8 tied 5 and lost 14 and were outscored 13 to 38. Their last away win was on Jan 2nd 2012 when they won 2-1. Chelsea beat Clapton Orient in the first Football League derby between two London clubs – in November 1905. The first derby in the top flight, between Chelsea and Arsenal at Stamford Bridge (November 1907), was watched by an estimated 55,000. As Highbury Stadium was built in 1913 on land owned by the Church Commissioners, Arsenal agreed not to play on Christmas Day or Good Friday, until they bought the freehold in 1925. The last Christmas Day game there was against Chelsea in 1954. When Spurs were relegated in 1934-35, a year after finishing third, they lost both games to League Champions Arsenal – by 5-1 at Highbury and 6-0 at White Hart Lane; still their joint record home defeat. If you think fixture congestion is bad these days, in 1905-06 Chelsea had to play a League game and FA Cup qualifying round tie on the same day. Prioritising the League, they sent their reserves to meet Crystal Palace in the Cup and lost 7-1; still the heaviest Cup defeat by any League club against non-League opposition. For the 1989-90 season London had a record number of clubs – eight – in the top division, meaning 56 derby matches. Arsenal, Chelsea and Tottenham finished in the top five while Charlton and Millwall were both relegated, the remaining three teams were, Crystal Palace, Wimbledon and Queens Park Rangers. Arsenal have finished as highest placed London club 58 times, more than everyone else put together. It includes a run of nine successive seasons from 1996-2004; the longest sequence since they were the capital’s only representatives more than 110 years ago. Steve Bould scored the quickest-ever own goal in the top flight in the Sheffield Wednesday v Arsenal fixture on Saturday February 17th 1990. The Arsenal defender put one past his goalkeeper John Lukic after just 15 seconds. This entry was posted on Saturday, October 6th, 2018 at 7:15 am and is filed under Uncategorized. You can follow any responses to this entry through the RSS 2.0 feed. You can leave a response, or trackback from your own site. GN5. Thank you as always. Some good stuff as ever. Oh, I’m sorry. Put the post up too early. Here’s BR’s vid with the 360 feature – simply stunning……..
Really enjoyed the London Club trivia. Thank you GN5, excellent intro to the game, my day is complete now. 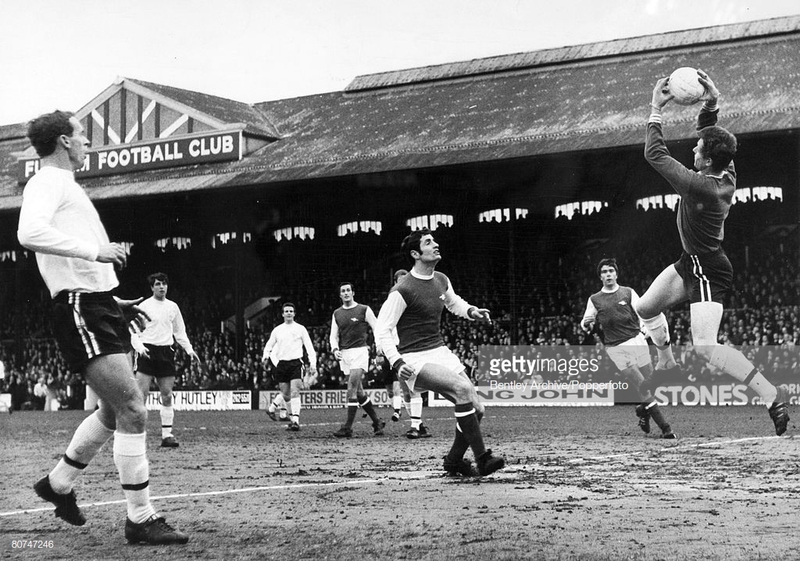 Craven Cottage was a true real football ground. Quaint, compact, with a sense that you would always see quality football, without the on going threat of a place like, for instance, Upton Park. Didn’t see much of him live, but Johnny Haynes, was a pass master, in the same bracket as one of my all time early heroes, George Eastham. Bobby Moore and Bestie graced the turf in the early 70’s and I went to the West Ham v Fulham Cup Final at the old Wembley, courtesy of a friend’s spare ticket. For me anyway, it’s great to see them back in the top division. 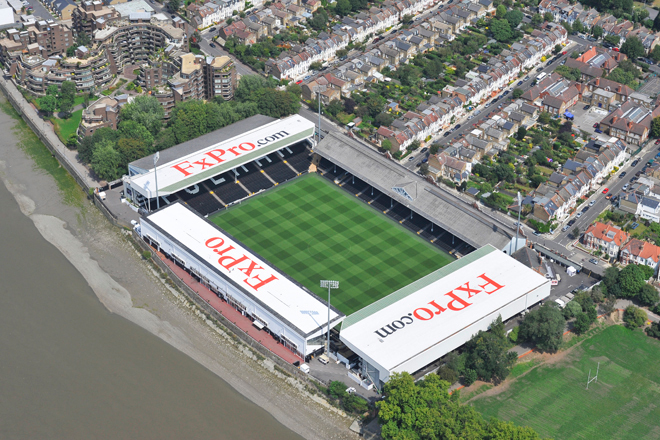 Interesting piece about Craven Cottage. That photo of the wooden seats and the mural at the end of the stand is just lovely. I’d forgotten the changing rooms were in the Cottage and are tiny. Also mentions the geezer who used to fish balls out of the Thames up until 1972. Clammy hands and feet from watching that climbing clip. Very good though. I used to always got to Fulham and try and buy a ticket from a tout, I am not sure that is possible any more? Do they still exist Chas, probably yes but in the same number? Manu have become an enjoyable watch, who would have thought? Just the thought of giving money to a tout makes me feel queasy. The man of the match on the bench made me laugh. I remeber being shocked by the wooden seats at CC. It was a lovely ground when I visited it and we usually won there. I went a few times when Best, Moore and Rodney Marsh played together. It was a real party atmosphere. Surely even that hard hearted villain, Micky ” no emotion stirs” Didit, can’t feel a tiny pang of goodwill towards FulhamFC, after all the efforts on the blog today. Naaaaah, he’s a lost cause…..GOG! Sky Sports pundits “Arsene Wenger has got to be new (Manure) manager”. Its perfect for him; he gets one over Mourinho and gets to stick two fingers up at us for the poor way he was treated at the end. Our defence leaves a lot to be desired but even Mustafi would get in theirs. I really hope he doesn’t go there. For his sake. It is too hard to imagine but if he did he would be taken on on a short term contract and therefore very little would be expected of him. I don’t understand why Mourinho hasn’t reverted to boring the life out of the opponents with his negative brand of football that has got him so much success, instead United are playing so hung ho. Still, I am not sure why I am complaining. What odds on Moaninho coming off the pitch and resigning? Going to have to put a lid on the cage to keep the animals in and keep other animals out. Horrible morning for BR … overloaded at a late night party and feel wretched this morning., despite the lovely nature vids. Don’t expect any flowing prose or insight.